So you have probably already figured out that dungeon leveling gets you to level 85 a lot faster than traditional solo questing. Pound for pound, second for second, you’re earning more experience because you’re killing a lot more creatures per second than you would if you were solo questing. However, wouldn’t you like to know more about the secret that could turbo-charge your leveling experience? If you were solo questing, you would probably kill other random creatures in the area you were questing just to get the experience, right? This is why it only makes sense to complete your dungeon leveling quests while you’re running the instances. After all, you’re already in the instances killing monsters, so why not double your leveling efforts by completing your dungeon quests also? It is a very economical use of your time if you spend it doing two things at once, and completing the dungeon leveling quests grants twice the experience of comparable solo quests. It just makes sense to do them. 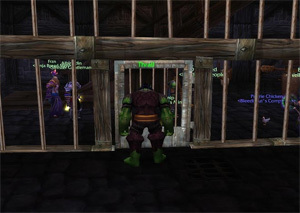 One of the problems many players encounter while dungeon leveling is that they never end up in the place where the dungeon quests are handed out. This is probably the number one reason why many players forget about dungeon quests altogether. After all, you’re leveling so quickly that you may not even have time to travel to the place where the quest givers are located, and this is especially true for healers and tanks, who have little to no wait times when using the dungeon finder. However, one of the easiest ways to collect the quests for whatever dungeon you are in is to ask the other players in your group. Often at least one of them will have traveled out to pick up the quests. If any of the other players in your group has the quests, he can share them with the rest of the group. Any players who are eligible to complete the quests will see a dialogue box that asks them if they want to accept the quest. Always click “accept” if one of these dialogue boxes ever opens because some players will share their dungeon leveling quests without even asking. Another reason you will definitely want to make it a point to complete your dungeon leveling quests is because there are plenty of additional bonuses to be earned from dungeon leveling quests. The gear you’ll earn is much better than anything you’ll earn while solo questing, and you’ll also earn a lot more gold in a shorter amount of time. In general, the dungeon quests will grant you more gold than solo quests, just as they grant you more experience. All in all, there are just far too many reasons that it’s worth a trip out of your way to pick up the dungeon quests. Can you really afford to keep on skipping them?